Right after the game, the social media – including comments from AKP deputies and associates -was riddled with attacks against ‘ÇARŞI’, the fan group of the Beşiktaş football club. Thus, it is evident that ÇARŞI are being painted as the culprits of the pitch invasion and violence of the Sunday game. However, since Beşiktaş will now be banned from having supporters present at its games, the ‘losing side’ of the incident is also ÇARŞI and the wider Beşiktaş fan base, a clear contradiction in terms. To highlight the inadequacies in this account of events, that a bunch of Beşiktaş supporters got frustrated by a player being booked and raided the pitch, you have to appreciate something of the climate in which the football season has kicked off, and in particular, ÇARŞI’s centrality in the protest movement against the AKP throughout the summer months in Turkey. Following the crackdown on Gezi Park and the dispersal of demonstrators, as a public space where citizens congregate, football stadiums have indeed become spaces where citizens voiced their support for the Gezi demonstrations and their protest against the AKP regime. The chant “Everywhere is Taksim, everywhere is resistance” was echoed in all first week Turkish league fixtures in late August. To a lesser degree, these chants are still ongoing. I say to a lesser degree because prior to the start of the season, the Interior Minister warned that politically motivated chants were illegal at football games, giving an indication as to what those bold enough to raise their voices in opposition to the AKP publicly could expect. At another point, in the context of politically motivated chants at stadiums, the Minister of Sports stated that Turkey had been combating terrorism for 30 odd years and that they would not shy away now. These examples go to show the government’s preference for using the stick and treating its own frustrated citizens as terrorists. Very fitting when considering all along the issue has been a lack of democratic governance. The conservative clampdown of the AKP with regards to alcohol restrictions were also initiated in September, including breathalyser tests at football stadiums that result in the barring of supporters who are ‘found guilty’ of being over the alcohol limit. A new electronic ticketing system has also been introduced at stadiums which involves the monitoring and profiling of football fans. In sum, football has been a pain to watch (live and on screen) with the ridiculous number of police present at all matches since the beginning of the 2013-2014 league and all the invasive measures taken to ‘depoliticise’ football. Most games have created some sort of newsworthy headline one way or another. Either through LigTV’s – the TV provider of the Turkish League – complicit support of the AKP government by muting the voice of fans at the stadium chanting against the government, or through reports that highlight the tension amongst supporters that were in support/opposition of the AKP. The Beşiktaş’s supporter group ‘ÇARŞI’ was one of the most vocal bodies to have stood up in support of the Gezi protests and the whole movement against the AKP from the beginning. Needless to say, the authorities have been eager to contain ÇARŞI. This was already highlighted through the arrest of numerous ÇARŞI members in the very first waves when the ‘mastermind’ culprits behind the Gezi movement were being ‘unearthed’ in the witch-hunt that started in June. I wasn’t at the football game on Sunday. I wasn’t even in Istanbul. However, testimonies from people who were at the stadium and reports from the media highlight very clearly the unique conditions at the game on Sunday. Although security at stadiums have been upped due to a general increase in police presence at public places, only 500 policemen and 1500 private security guards were commissioned for the derby game. In the run up to the game, newspapers reported on a national record high attendance for the game where over 77,000 tickets were sold. In comparison, at another derby on August 18 between Galatasaray and Fenerbahçe (played in Kayseri), 2000 policemen and 1000 security officers were commissioned. I’m not trying to defend high levels of police at stadiums as the way to tackle any problem, but I do find it puzzling that the authorities would commission less police for a vastly larger crowd which has been known to be the most vocal critic of the government. Then there was the recent creation of an alternative Beşiktaş supporter group called ‘1453’ (the year Istanbul was conquered – very neo-Ottoman). Mehmet Baransu from Taraf Newspaper elaborates on traces on the internet that highlight links between AKP’s youth organisations and this new 1453 Beşiktaş group. Moreover, on his Facebook page, one of the AKP’s youth leaders is careless enough to boast how he got free tickets for the game and was personally one of the first to invade the pitch. On the one hand, a police force that has been extensively used at sports events were withdrawn or ‘under-represented’ for the most packed game in Turkish football history. On the other, free tickets were given to members of an alternative Beşiktaş supporter group that was formed in opposition specifically in relation to ÇARŞI’s Anti-AKP stance. This group was seated right in front of the pitch and were one of the first groups onto the pitch. Beşiktaş will now be banned from playing in front of its supporters, meaning no more anti-AKP chants. As far as the AKP are concerned, this is a positive outcome. There is an upcoming fixture where Beşiktaş play Rize Spor in Erdoğan’s hometown. Then there is of course the Istanbul games in Kasımpaşa. Whichever way you look at it , this looks like bending the rules of the game to say the least, and it may still have to be counted as an ‘offside goal’. 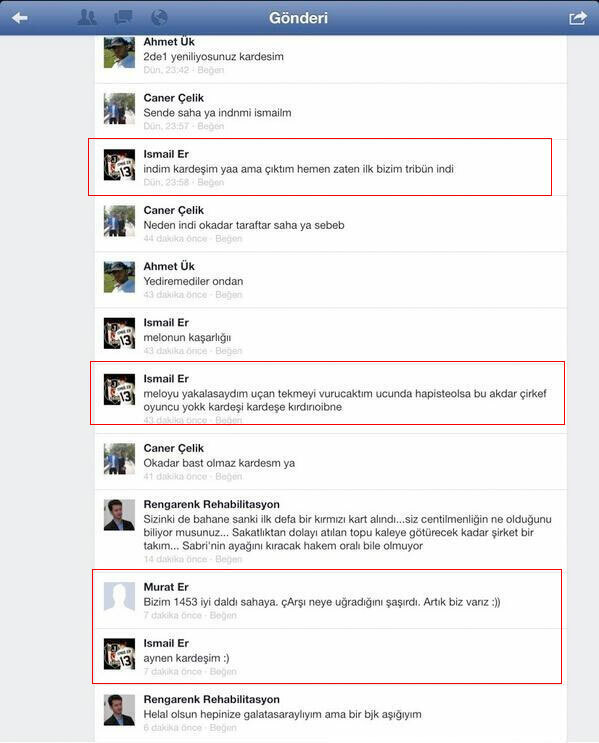 The screenshot taken from a dialogue on Facebook between Ismail Er, his brother Murat Er and a third person (Caner Çelik) confirms the claims that the Beşiktaş group called ‘1453’ were behind the pitch invasion and that Ismail Er was part of the first group that ignited the pitch invasion. 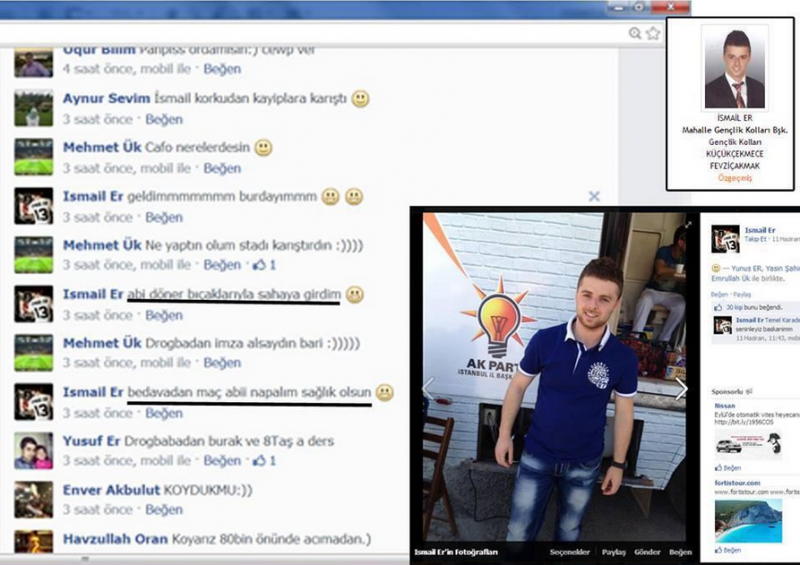 The second screenshot has a profile photograph taken from the AKP’s website that shows Ismail Er as the AKP’s Küçükçekmece (in Istanbul) district youth organisation president. Moreover, a photo taken in front of an AKP campaigning bus confirms his affiliation. Through statements made on Facebook, Ismail Er states that he got the match tickets for free (they were handed out to him) and that he invaded the pitch with a weapon.